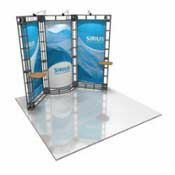 Trade shows offer a great opportunity to tell people about your product or service while generating a lot of leads in a short time. 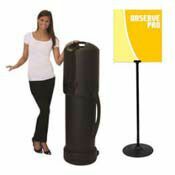 The challenge is to stand out among an exhibit hall filled with businesses in the same industry. 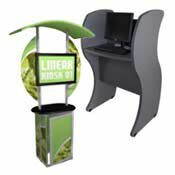 Create buzz at the show with signage, displays and graphic popup kits to attract more prospects to your booth. 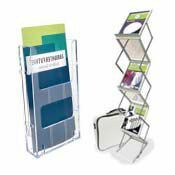 Once you have their attention, make the most of the time with display systems, product merchandisers and literature racks to give them a good idea of the benefits of doing business with you. 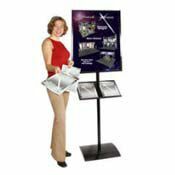 Have tablet stands and mounts to walk them through your site and computer access stations to capture contact information so you can follow up after the show. 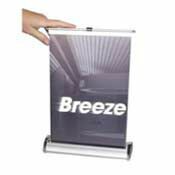 Banners and Stands, Catalog Racks and Reference Systems, Computer Access Stations, Display Systems, Freestanding Information Boards, Graphic PopUp Kits, Kiosks, Lighting and Accessories, Literature Racks, Product Merchandisers, Signage and Displays, Tablet Stands & Mounts and Tents & Accessories.